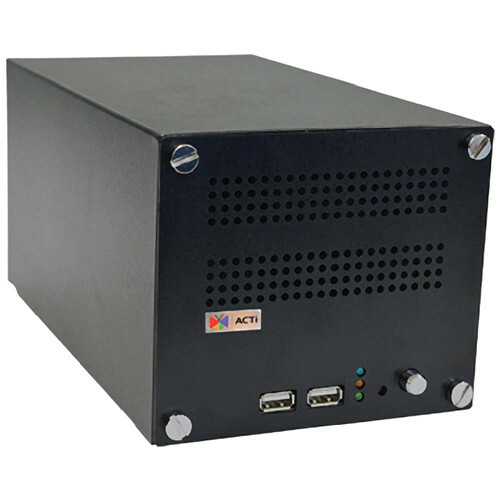 The ACTi Standalone Network Video Recorder ENR-1000 is a good solution for security personnel who need safe and reliable storage for their digital content, and network access to their camera systems. It features four channels to manage up to four cameras at once, and includes remote monitoring, scheduled and event-triggered recording and a 2 disk hard drive bay to add your own storage medium (cameras and disks not included, sold separately). The installation of this unit couldn't be easier. You plug it in, install a hard drive, and attach either a LAN cable from your existing DHCP server or use the other LAN port to connect to a PoE switch box (optional sold separately). You then install up to four IP cameras to that PoE switch, and a monitor (optional, sold separately) to the HDMI port, and you're ready to view H.264 compressed video in 1920 x 1080 resolution. The integrated DHCP on LAN Port 1 will assign IP addresses to each of the network cameras so that you can view the captured video remotely. It even includes dual USB ports so you can add a keyboard, mouse or extra storage to the NVR ENR 1000 (keyboard, mouse and storage drives are optional and sold separately). You can record your video using a predefined user schedule, or you can use event recording - video capture that is triggered when an alarm event occurs. You can also instantly record with a mouse click, and view that video at 30fps per camera (up to 120fps total). The recorded video is searchable on a 24 hour time bar and has forward and playback speeds of 1/2x, 1x, and 32x. This unit also allows video cropping of certain segments (1-30 minutes long) to export as a video clip in AVI/RAW formats via USB storage. For convenience, you can configure the display to show 1-4 different camera views, and automatically switch between full screen views by double-clicking on the window you want to enlarge. There are 32 go/set preset points along with full PTZ controls. The ACTi Standalone Network Video Recorder ENR-1000 supplies a good base from which to expand your security system. If you want to construct a security module from scratch, start with this standalone network video recorder. Box Dimensions (LxWxH) 15.3 x 8.0 x 7.5"
Standalone Network Video Recorder ENR-1000 is rated 4.0 out of 5 by 1.
what is the Processor configuration? Acti currently doesn't publish the components used in this model.